7.1 What is typing good for? The Web is causing a revolution in how we represent, retrieve, and process information Its growth has given us a universally accessible database, but in the form of a largely unorganized collection of documents. This is changing, thanks to the simultaneous emergence of new ways of representing data: from within the Web community, XML; and from within the database community, semistructured data. The convergence of these two approaches has rendered them nearly identical. Now, there is a concerted effort to develop effective techniques for retrieving and processing both kinds of data. Data on the Web is the only comprehensive, up-to-date examination of these rapidly evolving retrieval and processing strategies, which are of critical importance for almost all Web- and data-intensive enterprises. This book offers detailed solutions to a wide range of practical problems while equipping you with a keen understanding of the fundamental issues including data models, query languages, and schemas involved in their design, implementation, and optimization. 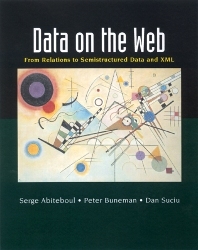 You'll find it to be compelling reading, whether your interest is that of a practitioner involved in a database-driven Web enterprise or a researcher in computer science or related field. Serge Abiteboul is Senior Researcher at I.N.R.I.A. and a professor at the École Polytechnique. He received his Ph.D. in computer science from the University of Southern California in 1982 and his Thèse d’Etat from the University of Paris XI in 1986. His recent research has focused on object databases, digital libraries, semistructured data, data integration, and electronic commerce. Peter Buneman is a professor in the Computer and Information Science Department at the University of Pennsylvania. He earned his undergraduate degree from Cambridge and his Ph.D. from the University of Warwick. His research interests include databases, programming languages, cognitive science, and classification theory. Dan Suciu is a researcher at AT&T Labs who received his Ph.D. from the University of Pennsylvania in 1995. He has devoted his recent research and publications to various aspects of semistructured data, organizing several workshops on the topic and serving on the committees of ICDT, PODS, and EDBT.